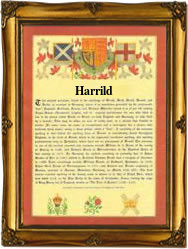 Recorded in several forms including Harrald, Harold, Harrold, Harrild and others, this is an English surname. It has two known origins. The first is from the pre 7th century personal name "Hereweald", or the similar Norse-Viking "Haraldr" or even the Continental form of "Herold" introduced to Britain by the Normans at the famous Conquest of 1066. All trace their origins to a pre 5th century Germanic personal name "Heri-wald" meaning army-rule. The Roman historian Tacitus records a certain "Harivolda", as being chief of the Germanic tribe of the Batavi, as early as the 1st Century A.D. A second possible origin was occupational for a herald. Here the derivation is from the pre 10th century Old French "Herault". The surname is first recorded in England in the12th century, (see below). Other early recordings include Radulfus Harold in the tax registers known as "Feet of Fines" for the county of Yorkshire in 1196, and Philip Harald in the Subsidy Tax Rolls of Sussex in 1327. Surviving church records of the city of London list the christening of William Harold on the 22nd September 1578 at St. Mary Abchurch, and the marriage of James Harrild to Elizabeth Ashby on the 5th June 1597 at St. Botolph's Bishopsgate. The first recorded spelling of the family name is shown to be that of Ralph Harold. This was dated 1171, in the Pipe Rolls of Yorkshire, during the reign of King Henry 11nd of England and known as "The Church Builder", 1154-1189. Surnames became necessary when governments introduced personal taxation. In England this was sometimes known as Poll Tax. Throughout the centuries, surnames in every country have continued to "develop" often leading to astonishing variants of the original spelling.